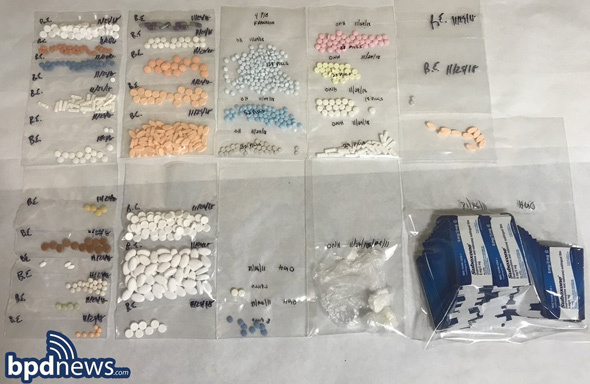 Boston Police report arresting Larinso Myers, 69, yesterday morning after a search of his apartment at Council Tower, 2875 Washington St. in Roxbury, found "hundreds of prescription narcotics" and a loaded, high-capacity gun. Myers, who has drug convictions dating to the early 1990s, was formally charged with several counts of possession of Class B, C and E drugs with intent to distribute as well as unlawful possession of a firearm, unlawful possession of ammunition and unlawful possession of a high-capacity feeding device, police say. Police say that officers with a search warrant entered Myers's apartment at 1:20 a.m. and found numerous bags full of various prescription narcotics pills, a Taurus PT111 PRO firearm loaded with 11 rounds of live ammunition, magazines for the gun, more ammunition, a stun gun and lots of cash. A Roxbury Municipal Court judge set bail at $10,000, the Suffolk County District Attorney's office reports. Myers was convicted in 2010 on various distribution charges for a 2008 arrest that started when a state trooper pulled him out of his pickup partly because he was weaving across lanes, partly because he told the trooper he was heading from Lowell to Brockton - while heading north on 128 in Wakefield. He has twice appealed other convictions, one from the early 1990s, without success. Yeah, real great war you're fighting there if the "enemy combatant" is allowed to keep "attacking" for three decades. Clearly no one on is tougher on minor crimes, and of course by extension a better person, than yourself. Why not execute him on the spot - mission accomplished! I support the legalization of drugs and don't believe that a death penalty should be given for selling them. So this career dirtbag is living in subsidized housing (on our dime), running a drug business, and toting an illegal firearm (along with multiple previous drug convictions). Assuming he will be back on the streets in no time (thanks Massachusetts), I think he should lose the "elder" apartment pronto. No reason for us to be paying for this zero's housing so he can continue to be a drain on our society. That he's still going to be living on the taxpayer dime if convicted. People like him will always need hard-working citizens to carry their sorry asses and foot the bill for their existence - be that on the streets or in prison. They are a true drain on society. But at least while in prison, he won't be selling drugs in our neighborhood or getting ready to shoot someone with an illegal firearm. Between someones taxes being used to keep the community safe and paying for an individuals personal enrichment. and he wont be able to get "
and he wont be able to get " escorts", goes with the territory. in 2012, the average American taxpayer making $50,000 per year paid just $36 towards the food stamps program and about $6 per year for the rest of the social safety net programs. Please Simmer down with your NOISE. When did I say anything about not wanting to support social programs? I gladly support these systems via my taxes, and through private/personal donations. However, I do not want to support scumbag criminals who milk the system while destroying our neighborhoods with drugs and illegal firearms. Is that what you consider "noise"? Does your definition of a "safety net" include paying for a repeat criminal drug dealer's apartment? I thought I was pretty clear - please try to follow along. The real question is how much would they be paying if it were voluntary and not with the threat of jail for not paying your taxes. they are medications prescribed by medical providers right in his neighborhood. More of your tax payer's money being siphoned off by the underground economy and allowed to operate by our own systems. Suboxone provider over prescribe, two 8 mg strips are max for effectiveness, extra 8mg for "pain". It is a joke.